We can’t deny the fact that smartphone technology is constantly evolving and that too at a very fast pace. The new processor, new camera features and other enhancements are being introduced every year. It is not a matter of many years when dual cameras, fingerprint scanners and anonymous payments were a matter of distant dream. But now these are deemed to be the most awesome tech to watch out for in the approaching years. Whether you’re wondering about some major upgrade or you’re simply interested in what is to come in the near future, here are few smartphone technologies that you will most probably find in the upcoming devices in the future. As the smartphone technology is moving towards bezel-less displays and OEMs are usually coming up with brand new solutions to keep implementing the current technologies. Physical home buttons and fingerprint scanners are 2 of the few things to be sacrificed for more screen and henceforth under-screen solutions were developed. Some consumers were a bit disheartened when Galaxy S8 didn’t have this technology as the rear fingerprint scanner exactly is not ideal. However, Samsung is working on under-screen fingerprint scanner but it seems like the technology won’t be ready to welcome the new Galaxy Note 8.But don’t think that Samsung is the only company which works on fingerprint scanners as LG is also working on embedded solution. 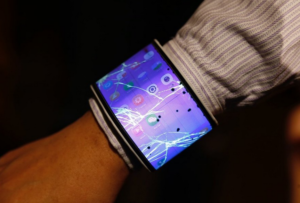 Flexible, bendable and foldable screens have been deemed to be the Next Big things which the gadget freaks are all waiting for. Now that we’re all set to welcome 2018, we appear to be getting close to the point of receiving this technology. There have been too many discussions and debates on foldable screens on smartphones but this new prototype has been welcomed by Lenovo after Samsung showed off the stretchable display earlier. In 2017, there have been too many leaks and rumors regarding Galaxy X foldable phone and as per the latest report, there is an announcement in 2018. We have seen flexible displays being implemented in phones similar to LG G Flex and G Flex 2 and this cutting-edge technology from Samsung is based on similar principles. Even though smartphones are super bendy, the phones don’t become stronger, flexible or thinner. However, one more thing to be noted is that the drop resistant displays are definitely going to be something that smartphone owners will boast of. It was the dual camera technology which became mainstream already in 2016 with mid-tier; flagship a budget-oriented models donning different configurations. There are dual camera setups which enhance image quality or provide different shooting modes but there is another trend that is being adopted with few OEMs and that is the utilization of zoom functionality. As part of third-party mobile phone accessories, telephoto lenses have become available for sometime now and they are usually inconvenient to carry along with you when you go to places. Oppo and Apple have downsized this technology within a smartphone with Oppo R11 and iPhone 7 Plus and OnePlus5, which all have 2x zooming capabilities even though all aren’t 2x optical zoom. Samsung is also all set to bring 3x optical zoom features to its Galaxy Note8 and they have shown the implementation a number of times even before. Therefore, if you’re someone who has been waiting for the latest technologies with regards to the smartphone world, you should be taking into account the above mentioned technologies. Make sure you use them in the best possible manner so that you can reap the biggest benefits from your smartphone.